In response to owners who are just starting out and are not convinced that buying an expensive fountain is a good idea but want to supply a quality fountain that is made in the USA, the Spectrum Pet Fountain is Glacier Point’s latest product and provides a long lasting and safe water supply for your one or two-cat household to prevent development of health problems, especially kidney disease and urinary tract infections. Pets no longer have to wait their turn for a quick lap of water; they now can each have their own stream of water from one of the two streams pouring from the antimicrobial treated tee top, or can drink directly from the bowl at any angle. The Spectrum Fountain constantly circulates the water which inhibits bacteria growth, keeping the water tasting fresh and appealing to pets! 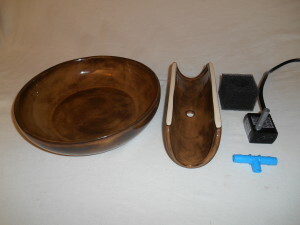 The Spectrum Fountain is best suited to pet owners who prefer to change the water daily or several times weekly. Its streamlined design allows for fast and easy cleaning – it is easy to clean and easy to keep clean! 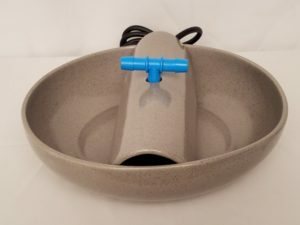 The Spectrum Pet Fountain is Glacier Point’s newest product and provides a long lasting and safe water supply for your one or two-cat household to prevent development of health problems, especially kidney disease and urinary tract infections. 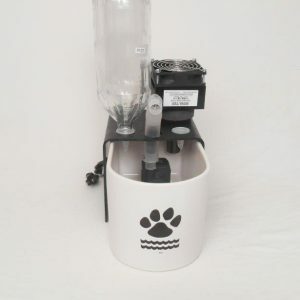 Pets no longer have to wait their turn for a quick lap of water; they now can each have their own stream of water from one of the two streams pouring from the antimicrobial treated tee top, or can drink directly from the bowl at any angle. The Spectrum Fountain constantly circulates the water which inhibits bacteria growth, keeping the water tasting fresh and appealing to pets! 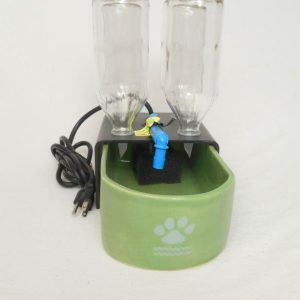 The Spectrum Fountain is best suited to pet owners who prefer to change the water daily or several times weekly. Its streamlined design allows for fast and easy cleaning – it is easy to clean and easy to keep clean! 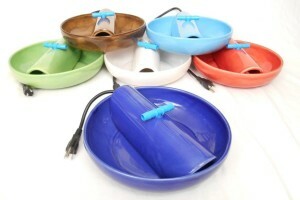 • Ceramic Pump Cover is lead-free and high-fired, and keeps the pump safe from inquisitive cats. • Adjustable, long lasting, and quiet submersible aquarium pump with 6-foot long grounded (3-prong) electrical cord provides safe use of electricity to prevent accidental electrocution. The water flow can be adjusted using the water intake valve on the side of the pump which will allow more or less water into the pump. • Tee Top with dual spout made from sterile pharmaceutical-grade tubing extruded with an inner liner that releases silver ions to protect against colonization by pathogenic bacteria. Silver ions also inhibit the growth of biofilm forming molds, fungi, and algae. 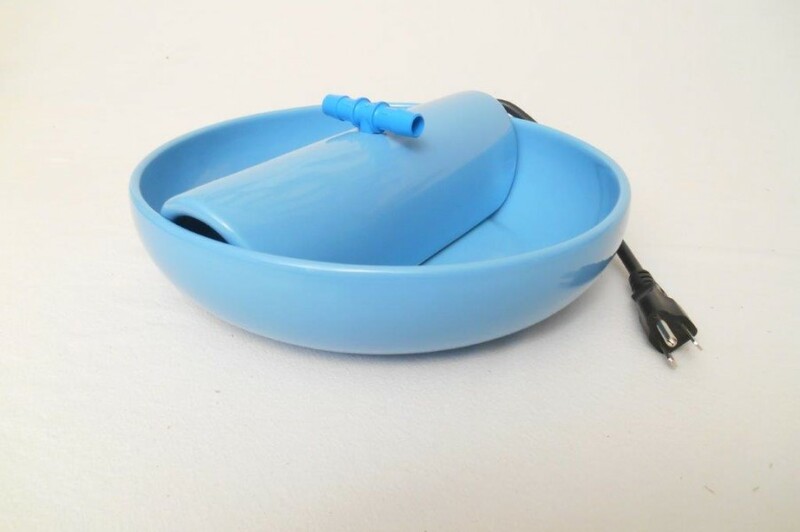 The Tee Top connects to the pump with a silver “Tygon” tube that is also antimicrobially treated to prevent the development of mold. 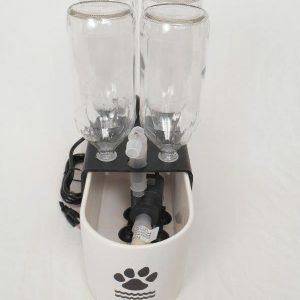 Great for cats who like to drink from a falling stream of water (like a faucet), or the Tee Top can be positioned parallel to the Pump Cover so the water will fall on the Pump cover making the water completely silent. 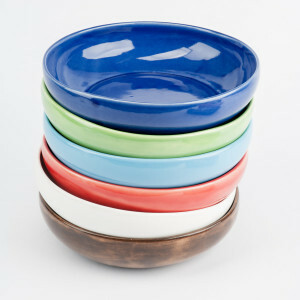 Great for cats who like to drink from a falling stream of water (like a faucet). 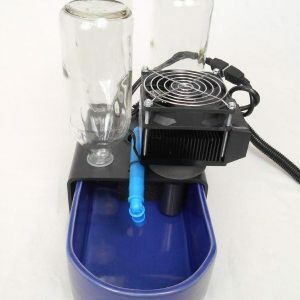 If your cats do not like the falling stream of water, the Tee Top can be removed and the water will enter the basin through a straight tube for a “bubbler” effect.